This phase diagram of water shows its phases at various temperatures and pressures. 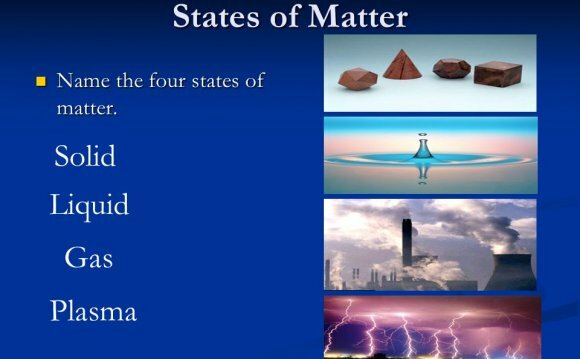 Matter can exist in four phases (or states), solid, liquid, gas, and plasma, plus a few other extreme phases like critical fluids and degenerate gases. Generally, as a solid is heated (or as pressure decreases), it will change to a liquid form, and will eventually become a gas. For example, ice (frozen water) melts into liquid water when it is heated. As the water boils, the water evaporates and becomes water vapor. Sometimes, a solid will go directly from solid to gas - this is call subliming. An example of sublimation is dry ice, the solid (frozen) form of carbon dioxide, CO2, which turns into gaseous carbon dioxide at standard temperature and pressure - there is no liquid phase of CO2 at standard temperatue and pressure. A solid is matter in which the molecules are very close together and cannot move around. Examples of solids include rocks, wood, and ice (frozen water). A liquid is matter in which the molecules are close together and move around slowly. Examples of liquids include drinking water, mercury at room temperature, and lava (molten rock). A gas is matter in which the molecules are widely separated, move around freely, and move at high speeds. Examples of gases include the gases we breathe (nitrogen, oxygen, and others), the helium in balloons, and steam (water vapor). A plasma is a gas that is composed of free-floating ions (atoms stripped of some electrons - positively charged) and free electrons (negatively charged). A plasma conducts electrical currents. Plasma was discovered by William Crookes in 1879. There are many different types of plasmas. There is plasma in stars (including our Sun); the solar wind in our Solar System is made of plasma. A supercritical (or critical) fluid is a liquid/gas under extreme pressure. These supercritical fluids have unique characteristics, the density of a liquid and the mobility of a gas. Supercritical fluids exist deep inside some planets; for example, there is supercritical water deep inside the Earth. Go to a printable phases of matter worksheet. Or go to the worksheet answers.